So. This is my first post on this shiny new blog. And for now, a blank page is staring back at me. See, the thing is, my head is full of ideas, chock full to be exact, ideas of what to bake, what to cook, what to eat (and who to eat it with) and what to write, and yet, I spent another day working late. And I can’t even complain, at least I ate at home. Yes, leaving the office at 8 on a cold November evening to run home to a house that currently has no heating was maybe not the best idea, but at least I got some exercise in and am eating at home before doing further work from home. And yes, dinner was nothing blog-worthy, involving a veggie wrap and some grapes. But at least there was a cup of tea and an oatmeal chocolate chip cookie for dessert. And in case you are wondering where the cookie recipe is in this post, let’s just say ‘I’m not quite there yet’. See, the web is full (some people might say littered) with chocolate chip cookie recipes, whether they be vegan, gluten-free, chewy or crisp, you name it. And while this would certainly give the impression that whatever type of chocolate chip cookie one desired to bake the only thing in between oneself and a glass of cold milk and some chocolate chip cookies was choosing the right recipe. And that is where the problem lies – there are gazillions of recipes out there and none have so far yielded the perfectly crumbling chocolate chip cookie with a soft doughy centre that I dream about. So now I am determined to find the recipe that works for me and in my oven. I have tried 3 different recipes already, 2 came close and 1 was far off – reminding me more of my mum’s crunchy oatmeal cookies than anything else. Nice, but not what I was looking for. Because what I am looking for is this: the kind of chocolate chip cookie that you can’t just grab from a plate on the kitchen counter by pinching it with your thumb and index finger before tip-toeing out of the kitchen, because by the time you make it back to your room all that is left between your thumb and index finger would be a penny-sized piece of the cookie, the rest forming a neat little path of chocolate chip cookie crumbs from the kitchen all the way down the hallway and ending right by the door to your room. That’s how soft a chocolate chip cookie should be. Because, let’s be honest with ourselves, what we really want is not a chocolate chip cookie, no, we want chocolate chip cookie dough and if we can’t have that (mum says it gives you stomach ache) then we want the softest, chewiest, most crumbling chocolate chip cookie we can have. A cookie that has been in the oven just long enough to form the slightest golden crust on top. We all know this crust is for appearances only and what is waiting underneath is the real deal, half-baked chocolate chip cookie, ideally straight out of the oven so in between burning your tongue on the slightly caramelized cookie dough we bite into puddle after puddle of velvety melted chocolate… So yeah, as I said, ‘I’m not quite there yet’. But I will be. Work permitting, sooner rather than later. And then I will share the recipe. And these? Two little bags of white sugar. 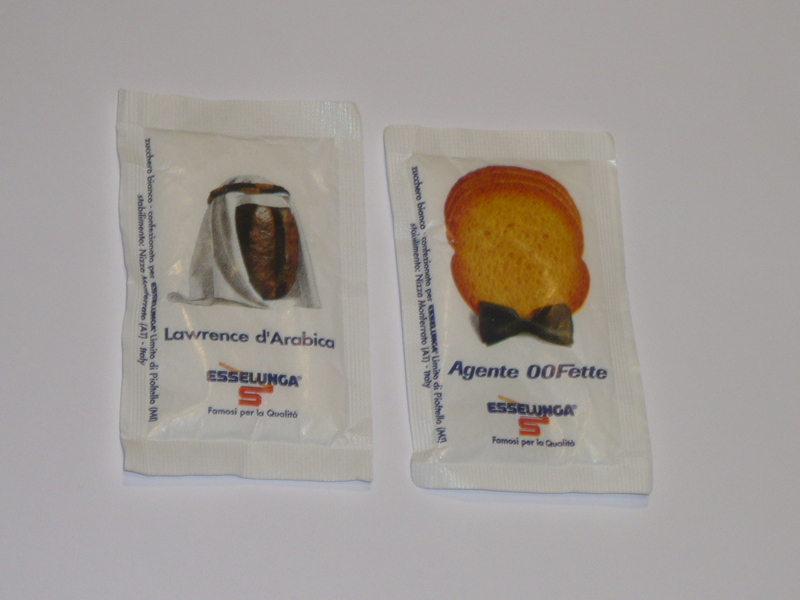 Alessandro and I found these in a cafe recently and while Alessandro is a huge fan of “Agente OOFette” (fette in Italian means slice), I have fallen for “Lawrence d’Arabica”. Update on the hunt for the perfect chocolate chip cookie recipe: I think I might have found it. Or a serios contender at least – easy peasy to put together, 12 mins. of baking time and you end up with perfectly chewy yet slightly crips on the outside chocolate chip cookies with a perfect ratio of chocolate to cookie, made even more divine with a sprinkle of sea salt on top of the cookies. Shall re-bake them to make sure it wasn’t some fluke and will then post the recipe if I am still as happy with the outcome as I was with the previous batch!